Jaco Aerospace and Industrial is your one stop resource for 3M(TM) Adflo(TM) PAPR with 3M(TM) Speedglas(TM) Welding Helmet 9100-Air, 35-1101-30SW, HE filter, Li Ion Battery, ADF 9100XX, 1/C and all of your 3M Products, Tapes, aerospace and industrial needs. 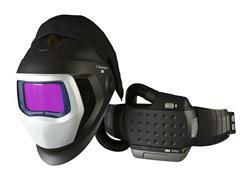 SKU Marketplace Product Description: High Efficiency particulate respiratory protection system for welders. Lightweight, compact design. 3M(TM) Speedglas(TM) Welding Helmet 9100-Air has adjustable head suspension, increased peripheral vision and excellent optical quality and function.